Several artists, such as Walter Crane, sketched caricatures of Charles Ricketts and Charles Shannon. 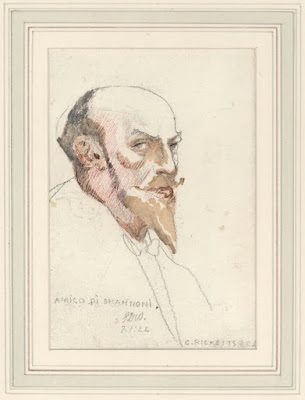 One of the lesser known caricatures was drawn by Francis Derwent Wood (1871-1926), an artist whose portraits were given to the Royal Academy of Arts by his widow. A number of these, including his drawing of Ricketts, are published on the society's website. The Ricketts caricature is a drawing in pencil, wash and pen and ink on wove paper. Most of these sketches seem to have been made at Royal Academy banquets and Chelsea Arts Club dinners. Ricketts and Shannon knew Wood around the time that he did these caricatures. 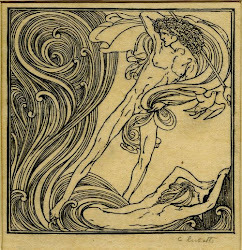 Some critics have asserted that these drawings were 'made upon odd scraps of paper, upon envelopes and so forth', but the commentary written on behalf of the Academy states that they were not always 'as spontaneous' as it seems, and for the Ricketts portrait Wood used materials that he wouldn't have carried with him at all times. Wood also made such portraits of other public figures, including 'politicians, clergymen, connoisseurs, and aristocrats'. Several portraits have written comments on them, such as 'Gerald Kelly, the Festive ARA', others simply identify the artist. Ricketts is identified as 'C. Ricketts, A.R.A.' and above his name it says: 'AMICO DI SHANNONI'. The portrait is signed and dated 7 January 1922.